Do you have a Royalty BD account? Do you want to earn Royalty Cash Coupons? Then what are you waiting for? 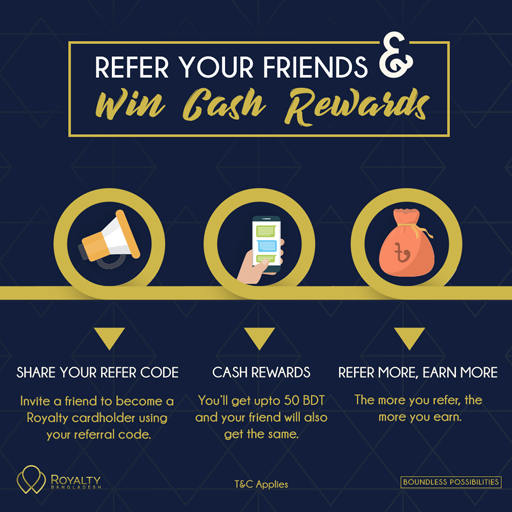 Invite your friends and earn cash bonuses worth BDT 50 for each referral and it gets better, your friend can earn the same! Log in to your account, under the Rewards section, you will find your referral code. Copy & share your code with your friends and family. Once they apply for Royalty BD card and receive it, you both will earn the same cash bonus! Every time someone registers & buys Royalty Card using your referral code, both of you will earn cash bonuses. For Gold membership, each gets a cash bonus of BDT 25 and for Platinum membership, each gets a cash bonus of BDT 50. When you have a BDT 250 cash bonus, you can redeem it at any of our partner stores! If you have not ordered your Royalty Card yet, order now! For more information on how to order, read our blog.